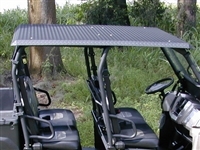 This roof will work with almost any brand of windshield or rear window. This all metal top is constructed of sturdy 1/8 inch aluminum diamond plate and is capable of supporting hundreds of pounds. It comes ready to install with no drilling required and takes only minutes.